(BULLOCH COUNTY) Leadership Southeast Georgia, a regional leadership development program, held its fourth of five sessions, focusing on educational and workforce factors that impact the region. The session, held in Bulloch County, also addressed agritourism and its impact on the local economy. On the first day of the session, the class heard a presentation on the Statesboro Blue Mile, an area of Bulloch County that is undergoing major restoration efforts, before taking a tour of the Blue Mile. 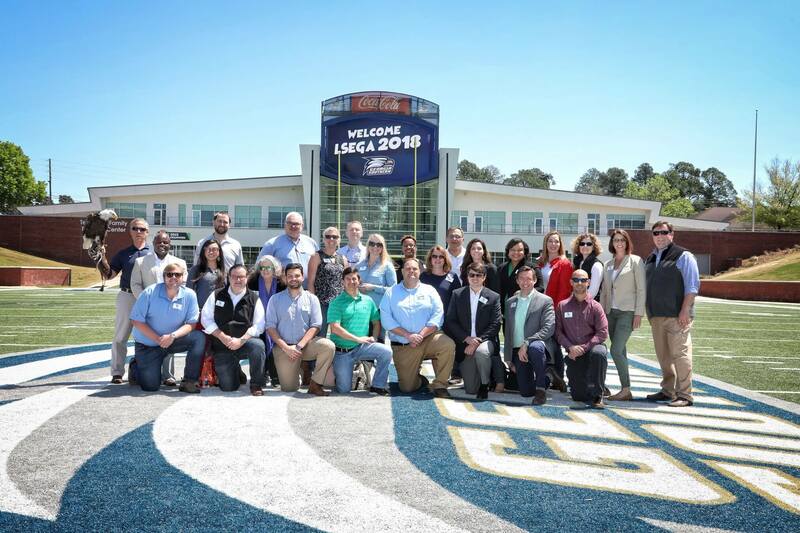 Later, the group visited Georgia Southern Universitywhere football coach Chad Lunsford led a tour of the Ted Smith Football Operations Center and university president Jaimie Hebert presented an overview and discussion of the school’s impact on the region. After lunch on campus, the class traveled to Hunter Cattle, a local beef farm in Statesboro, and enjoyed a “GA Grown” dinner prepared by Chef Holly Chute, Executive Chef for the Georgia Departments of Agriculture and Economic Development, at the barn at Olde Homeplace. The group began its second day at AgSouth Farm Credit where Jennifer Sammons Davis spoke to the group on how they support those in agriculture. The group also heard from Benjy Thompson of the Bulloch Co. Development Authority discussed the “Economics of Education”; Molly Bickerton, Director of Admissions for Ogeechee Tech, gave an overview of technical education as a post-secondary option and Scott Shelar, CEO of Construction Education Fund of Georgia, outlined issues related to workforce development. Other speakers included: Mayor Jonathan McCollar, City of Statesboro; Chairman Roy Thompson, Bulloch Co. Board of Commissioners; Phyllis Thompson, President of Statesboro-Bulloch Chamber of Commerce; Darron Burnette, Division CEO, Synovus; Keely Fennell, President, Blue Mile Foundation; State Representative Jan Tankersley; Senator Jack Hill; Kristan Fretwel, Hunter Cattle; Stephen Milner, Screven County Development Authority; and Commissioner Gary Black, Department of Agriculture. Since January 1999, as part of Leadership Southeast Georgia, representatives of business, government, education and non-profit organizations in 10 southeast Georgia counties have taken part in creating a leadership network for regional community and economic development. The annual five-month program is designed to grow and inspire engaged community leaders to improve the overall quality of life in the area. This year, the class is sponsored by Evans General Contractors, Gulfstream Aerospace Corp., The Sack Company (SACK), Georgia Southern Universityand Georgia Power. The next and final session will be held in Chatham County in May.